When the sun warns the ground and the flowers start to grow, the outside and inside meet on your beautiful wrap around porch. Imagine relaxing in the evenings while enjoying the summer breeze, watching the sun set, or catching a sunrise on the other side of your house. Adding a porch that wraps all the way around your house make life more enjoyable. Wraparound porches help make the most of the outdoors by offering multiple views. Most Wraparound porches are often covered allowing you to opportunities to entertain rain or shine, and with the additional shade that a roof provides it will help cut down on your summer cooling costs too. A wraparound porch is a very classic design that has been around for many years. A house with a wrap around porch has the quintessential characteristic of a southern home. A wrap around porch provides a place for gathering with friends and family or relaxing in that rocking chair at the end of a long hot day. 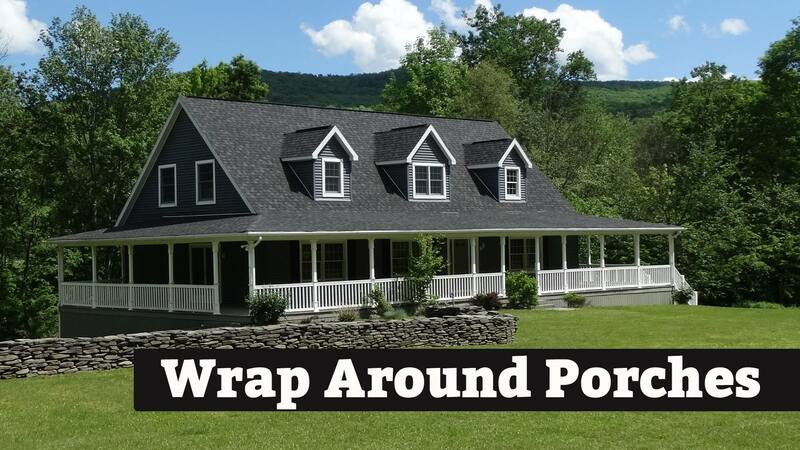 Wraparound porches help make the most of any view from your house and adds much desired curb appeal to you house. The most common building material for outdoor decks and porches is wood and there are many beautiful species of wood to choose from. Real wood decks have proven to be dependable, durable, great value and look great too. Composite decking on the other hand has some unique advantages over a wood deck. The main advantage over wood decking is that composite decking requires minimal maintenance and is more resistant to weather and insect damage compared to wood decking, and it can lasts longer before it needs to be replaced. Let a Kintner Homes design professionals make your dreams a reality! Contact Kintner Modular Homes for a consultation so we can help you design and build your dream deck or beautiful wrap around porch. A Beautiful Wrap Around Porch Designed and Built by Kintner Model Homes, call today.